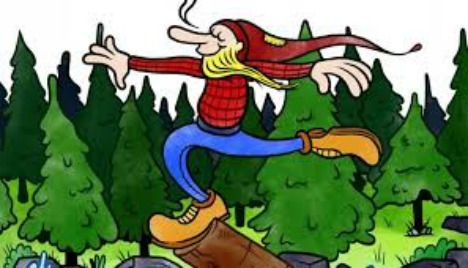 The Log Driver's Waltz: We New MexiJews, along with Jews all over the world, have (in most cases) made it through another delightful Passover holiday. Eight full days (here in חו״ל) of eating, sleeping, singing, reading, praying, and eating some more. So now it must be time to dance! On Sunday evening, April 9 (Mrs Abq Jew's birthday! ), Turner Classic Movies (TCM) was pleased to present (says Animation World Network) "a primetime program of screenings and interviews on animated short films produced by the National Film Board of Canada." On Sunday Night, TCM is showing a variety of these films through the decades from the abstract works of McLaren to 1988’s Academy Award-nominated cartoon The Cat Came Back. The evening tackles a wide array of subjects from nuclear war (The Big Snit) to mid-life crisis (Bob’s Birthday which would become the series Bob and Margaret) to our ubiquitous dependency on cars (What On Earth!) to the microscopic wonders of the world (Zea). Many of the films have been nominated or won Academy Awards for best Animated Short. You don’t have to have TCM to watch these films. Most (if not all) of these films are available on the internet, through either NFB’s website or NFB’s YouTube Channel. (I highly recommend the website as it has much better organization, but they both have a fantastic amount of videos and NFB’s YouTube will take you down a rabbit hole). 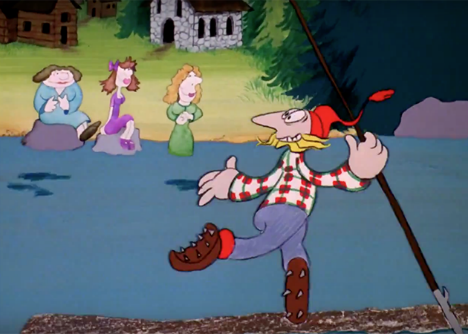 Abq Jew's favorite animated film was The Log Driver's Waltz, based upon a Canadian folk song written by Wade Hemsworth (here sung by Kate & Anna McGarrigle and the Mountain City Four).
. . . celebrates the profession of log driving, a practice in the lumber industry which involved transporting felled timber by having workers walk or run on the logs as they floated down rivers. This occupation required a great deal of strength and physical agility, and Hemsworth was struck by how much the sight of log drivers at work resembled dancing. Yes, Abq Jew is fully aware (and you should be too) that today marks 74 years since the beginning of the Warsaw Ghetto Uprising. And that יום הזיכרון לשואה ולגבורה Yom HaShoah viLaGevurah (Holocaust and Heroism Remembrance Day) will be observed this coming Monday, with many communities offering special programs this Sunday April 23. But until then - let's waltz! A log driver's waltz pleases girls completely!